This elevated photo of a five-level pipe rack confirms the need for detailed project planning and sophisticated project controls systems. This pipeway is part of a major crude unit expansion project performed for Koch Refining near Minneapolis, Minnesota. With the decline of the power sector in the mid-1980s, Cherne sought opportunities in other industrial construction sectors. In 1986, Cherne secured contracts for the mechanical work at Lake Superior Paper Industries' new paper mill in Duluth, Minnesota and at Koch Refining's facility in Pine Bend, Minnesota. While Cherne had done paper projects before, the Koch project was the company's first experience in the refining industry and provided exposure to new opportunities and new challenges. 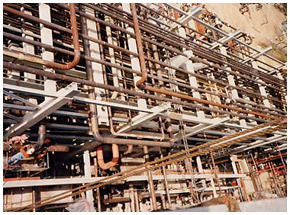 Cherne was ideally suited for refinery construction with its full service general contractor capabilities and its roots in mechanical construction. Following the 1986 Koch contract Cherne was awarded a second, much larger contract at Koch’s Rosemount facility. After successfully completing this second contract, Cherne looked to the Southern California region for refinery construction opportunities, an area that had seen only a few union projects for several years. 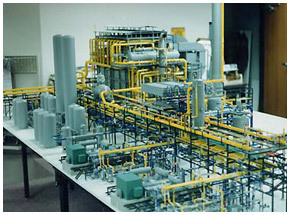 The plastic design models that routinely resided in construction offices of the 1980's have been replaced with virtual models housed inside 3D CAD programs. Using its historical productivity data Cherne was able to demonstrate to prospective clients that union construction, even with its higher wage rates, could actually be less costly than non-union construction. In 1989 Texaco awarded Cherne a cost reimbursable contract at Texaco's Wilmington, California refinery. Under the contract Cherne placed its fee at risk for cost performance creating a contract that had the flexibility of a cost reimbursable format while aligning Cherne and Texaco toward the goal of saving craft hours. The Texaco project proved very successful and was followed by additional contracts with Texaco in California and Kansas. Cherne's performance attracted the attention of other refiners and soon resulted in contracts with companies such as ARCO, Shell, Ultramar, Conoco, Chevron, BP Amoco, Ultramar, Sunoco, Tesoro and Equilon as well as additional work for Koch. In 1990 Cherne committed to an accident-free workplace by adopting its Zero Accident Program. This commitment has moved Cherne from industry average safety performance in 1990 to industry leading safety performance today. 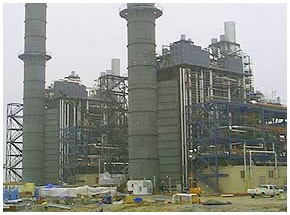 In early 2001, Cherne completed the mechanical installation package at the State Line Energy Project in Joplin, Missouri. Cherne Contracting confidently moved into the 21st century under the leadership of CEO Bill Cherne. Guided by its substantial refining, power, and general industrial construction experience, Cherne continued to improve its processes and services to meet the needs of our clients. In 2010, Cherne joined the Kiewit family of companies. Kiewit is a highly successful and diversified international company, founded in 1884, whose subsidiaries focus on infrastructure, industrial and commercial construction, as well as mining and engineering. This merger has strengthened Cherne even more. Cherne and Kiewit complement each other quite well, and being a part of Kiewit allows Cherne to offer a range of services and expertise that spans beyond what we traditionally could offer. Cherne partners with other Kiewit companies to utilize their expertise in estimating and building work throughout the country. The entire corporation is committed to safety, quality and client satisfaction, and is set up to ensure the success of its projects and in turn its clients.